Calculate performance daily.. .stop estimating day-weighting of transactions. Manage performance down to the security level. Eliminate performance delays at period ends. Create composites for any asset class. Calculate net and gross of fees. Demonstrate performance in a manner that mirrors the actual allocation of assets. Report performance over user-defined time periods. 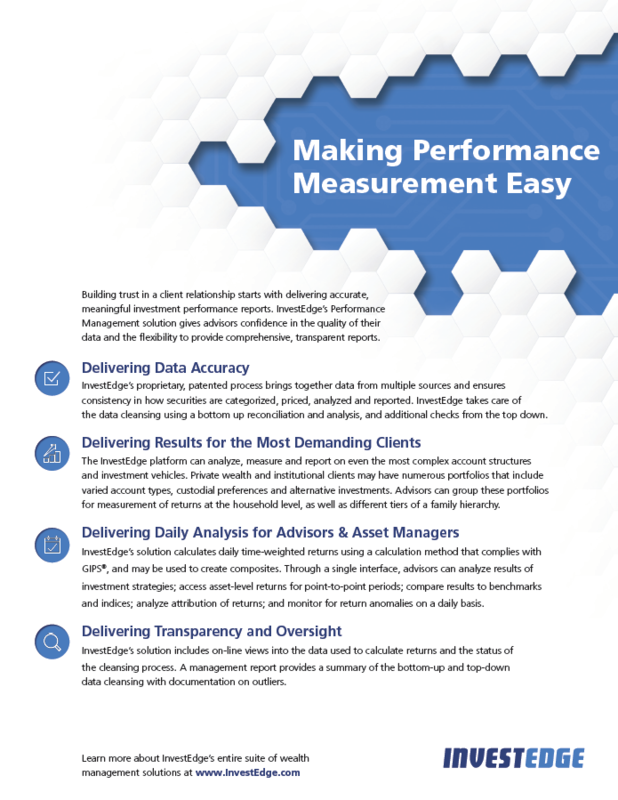 InvestEdge is the premier choice for calculating performance returns you-and your clients-can count on. Daily extracts including account, asset, holdings, and transaction data complemented with data vendor feeds (Baseline, Factset, Morningstar, etc.) are used to calculate returns at the asset level for each account. Asset-level performance enables returns to be rolled up into performance category returns; e.g. equity sectors, equity style, asset class, asset subclass, etc. As a result, you can easily report on performance in a manner that mirrors the actual allocation of the assets. InvestEdge also calculates asset weighted performance composites (both net and gross of fees). This enables advisors to make valid, relevant performance comparisons against all assets managed to the same style. Composite universes can include groups of accounts with similar objectives, as well as individual managers, etc. To calculate composites, InvestEdge uses a methodology based on time weighted rates of return, daily valuations, and trade date and accrual accounting for holdings. This equips you to analyze and report on key composite metrics such as portfolios and assets within the composite and annual rates of return. In addition, you can measure dispersion, including standard deviation of portfolio returns for any period, as well as cumulative returns for the composite and corresponding index over any time period. Coupled with the system’s reporting features, performance measurement from InvestEdge means managers can dynamically report on a holistic or apportioned view of any account, as well as groups of accounts. And thanks to customizable benchmarks, unlimited indices, and detailed attribution, demonstrating performance has never been easier.